Jeffrey M. Jentzen. 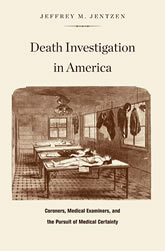 Death Investigation in America: Coroners, Medical Examiners, and the Pursuit of Medical Certainty. Harvard University Press, 2009. A death occurs at home, in a hospital, on a street: why? As Jeffrey Jentzen reveals, we often never know. Why is the American system of death investigation so inconsistent and inadequate? What can the events of the assassination of President Kennedy, killing of Bobby Kennedy, and Chappaquiddick reveal about the state of death investigation? If communities in early America had a coroner at all, he was politically appointed and poorly trained. As medicine became more sophisticated and the medical profession more confident, physicians struggled to establish a professionalized, physician-led system of death investigation. The conflict between them and the coroners, as well as politicians and law enforcement agencies, led to the patchwork of local laws and practices that persist to this day. In this unique political and cultural history, Jentzen draws on archives, interviews, and his own career as a medical examiner to look at the way that a long-standing professional and political rivalry controls public medical knowledge and public health.